The abomination at left is a $199 PC soon to be sold at Walmart. The self-described geeks at Engadget claim that its innards are actually quite small, and can't by themselves justify the big honkin' case. So why make the overall box so voluminous? From Engadget: "Research indicates that Walmart shoppers equate the size of a system to its capability." I suppose the tech-savvy set doesn't shop for PCs at Walmart, so this is at least understandable. It's just unfortunate that as perception is pandered to and reality ignored, usability is left by the wayside. A smaller computer scores better on many measures of usability: lower transportation costs and efforts, less packaging, a smaller footprint in the home, and less junk to chuck at the end of the product lifecycle. 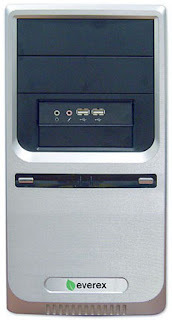 (Ironically and sadly, this computer is also marketed as a "green" machine.) But if perception can drive sales, it will continue to guide the product - and we all end up suffering just a bit from our ignorance. Did you see that Wal-Mart has already sold out of these computers? Yup, I saw that - I guess this whole "shoppers equate the size of a system to its capability" thing actually works, sadly enough! No, it means the mental capacity of the average Wal-Mart shopper meets the market research done on this product, if any. Just look at Vista. Intelligent people already own computers, now the void must be filled for every other yokel. Just look at the comments on Youtube and tell me any random imbecile can't just log on to the internet. what a nice gift for those kids that want a computer, but you just know they would screw something up if they had a real one.